At 4.15pm on a grey Monday in January, the London Stock exchange filled with a steady stream of women, and the reception room began to buzz with conversations, introductions and excitement at the evening to come. The Jewish Women’s Business Network launched with an event filled with an illustrious list of unique and inspiring speakers from a range of charities, tech and professional services companies, one day before they officially open the London Stock exchange. The PR Office proudly sponsored the event, and as such were privileged to bear witness to the inauguration. In this day and age, it is still uncommon for a panel to be made up exclusively of women, and even more so for two days’ worth of events to be filled with the same; however each speaker – either alone or on a panel – brought an astounding level of humility and honesty that gripped the room immediately. Whether the speaker was a young or veteran professional, (speaking as a communications agency) the calibre was second to none. Proceedings were opened by Diane Côté – Chief Risk Officer at the London Stock Exchange and Chair of Women Inspired Network – who welcomed the room both in English as well as (bravely) a few words in Hebrew. During the breakout session later in the day, the room was captivated by Elissa Bayer – Senior Investment Director at Investec – while she spoke about being the 17th woman to be admitted to the London Stock Exchange and breaking the male-dominated status quo of the banking world, while simultaneously raising her three daughters. This was quickly followed by the impressive Avital Bayer – one of her daughters – who is a strategist at Carmel 6000, and CEO of her own branding and strategy company in Tel Aviv – HiPitched. Following around three hours of remarkable sessions, Justine Zwerling – Head of Primary Markets, Israel, at the London Stock Exchange, and co-founder of the Jewish Women’s Business Network – rounded off the event thanking some of the extraordinary women who made it all possible, and swiftly invited the room to continue conversations over wine, food and free massages. Between sessions, phone numbers and business cards were exchanged over coffee with overtones of ‘meeting up for coffee next week’ being heard throughout. Unlike other events we attend, there was a clear sense of openness and vulnerability that perhaps is not seen in male dominated conferences or forums. 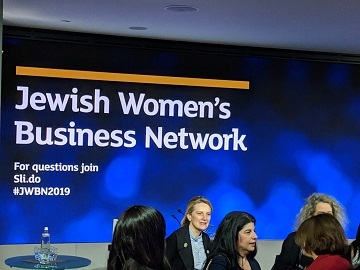 We are sure that the Jewish Women’s Business Network inaugural event will have been extremely beneficial to many women this week, and will continue to be for months and years to come. On Tuesday morning, The London Stock Exchange welcomed both familiar and unfamiliar faces, women and men alike, to announce this groundbreaking initiative as the Market opened. All guests were invited to assemble on the balcony to witness this momentous occasion as one community, united towards a common goal: empowering women in business. The atmosphere was electric as the countdown started and, once ‘1’ was reached, cheers of collective pride could be heard far and wide as all attendees looked optimistically towards the future. Following the opening ceremony, speeches were given by a number of influential female entrepreneurs who work across the business sector globally. Each had their own personal story to share with the guests, passionately voicing both the importance of the Network’s existence in the current climate and the inherent value of the work that they are committed to providing on behalf of businesswomen around the world. Diane Côté introduced the proceedings and her key message for the future was clear: in creating this new global community that promotes gender diversity and equality within the workplace, we each need to take responsibility to ensure that we continually mentor, inspire and support one another. Rt Hon Elizabeth Truss MP – Chief Secretary to the Treasury – and Marilyn Stowe – Stowe Family Law LLP – continued this discussion in a similar vein as they recounted the gender-specific obstacles that they faced as their respective careers progressed. In turn, they highlighted the necessity to raise the profiles of women in business and, in doing so, translate all these potential barriers into opportunities. Sharon Bar-li – Israel’s Deputy Ambassador to the UK – followed suit by reflecting on the importance of having a female role model and commended the newly launched initiative for providing a platform that will further advance progression for women within the workplace. Championing women’s capabilities as business leaders, Emma Sinclair MBE – co-founder of EnterpriseAlumni, UNICEF advisor and the youngest person to have opened the Market – spoke of how she became, in her words, “a stock exchange fanatic” at an early age, playing ‘Guess the share price’ with her father on her journey to school each day. The session was concluded by Fleur Hassan Hahoum – Deputy Mayer of Jerusalem – who emphatically questioned the very notion that underlies this debate: “what is female leadership?” She admitted that no-one will ever formulate a definitive definition, but aptly acknowledged that women have an equal yet distinct voice and place, both within the business sector and beyond. With mentors and supporters such as these leading the way, the future for women in business is certainly bright.